Arsenal F.C. Glass Tankard. pint glass tankard. in an acetate box. Arsenal F.C. Glass Tankard. pint glass tankard. approx 12cm tall. in an acetate box. official licensed product. .
1 x Plastic Freezer Tankard. When Frozen Solid, Remove & Fill With Your Favourite Beverage. Features With Large Club Crest On The Mug. Presented In Outer White Box Make It Ideal For Gift. Made From Plastic & Internally Filled With Liquid For Quick Freezing. Arsenal Tankard Glass. Arsenal F.C. Glass Tankard. pint glass tankard. This fantastic Arsenal FC Freezer Tankard Mug is an ideal gift for any Gunners fan. Place tankard in freezer until the inner liquid is frozen. Features the Arsenal club crest. Double walled mug with a cool cracked ice effect. Tankard - Danbury Mint Highbury Heroes by Terry Bright. Tankard - 22cm high. 11 mugs - Danbury Mint Heroes of Arsenal by Terry Bright. Plate - Danbury Mint Heroes of Arsenal by Rob Perry. Size (approx). Arsenal Freezer Tankard. Arsenal Freezer Tankard. If you like your beer ice cold then this official Arsenal freezer glass. 100% official Arsenal product which is ideal for all Gunners fans. 100% Offical Arsenal Product. Plastic freezer tankard. ARSENAL FC. In the unlikely you are not entirely happy with your item. 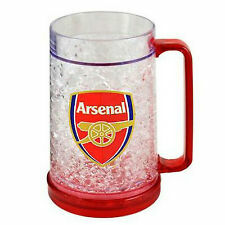 Arsenal Freezer Tankard. 100% Official. Arsenal FC. This is a quality item for a very good price. PRODUCT DETAILS. Arsenal F.C. Freezer Mug. plastic freezer mug. approx 15cm tall, 9cm in diameter. with a swing tag. official licensed product. .
Official Arsenal FC Freezer Mug with large club crest design. Ideal gift for Arsenal FC fans. This freezer mug is made from plastic and is internally filled with liquid for quick freezing. All problems can be resolved. Weight in grams : 569.00. 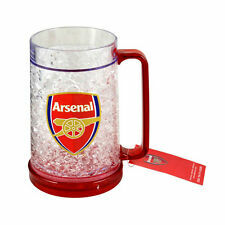 Arsenal Boxed Freezer Tankard. Filled with liquid within the plastic. Freeze cup for a chilled drink. Arsenal FC. This is a quality item for a very good price. PRODUCT DETAILS. ARSENAL FC FREEZER TANKARD. ENJOY YOUR FAVOURITE DRINK ICE COLD BY USING THIS NEW TANKARD. Features With Large Club Crest On The Mug. Made From Plastic & Internally Filled With Liquid For Quick Freezing.